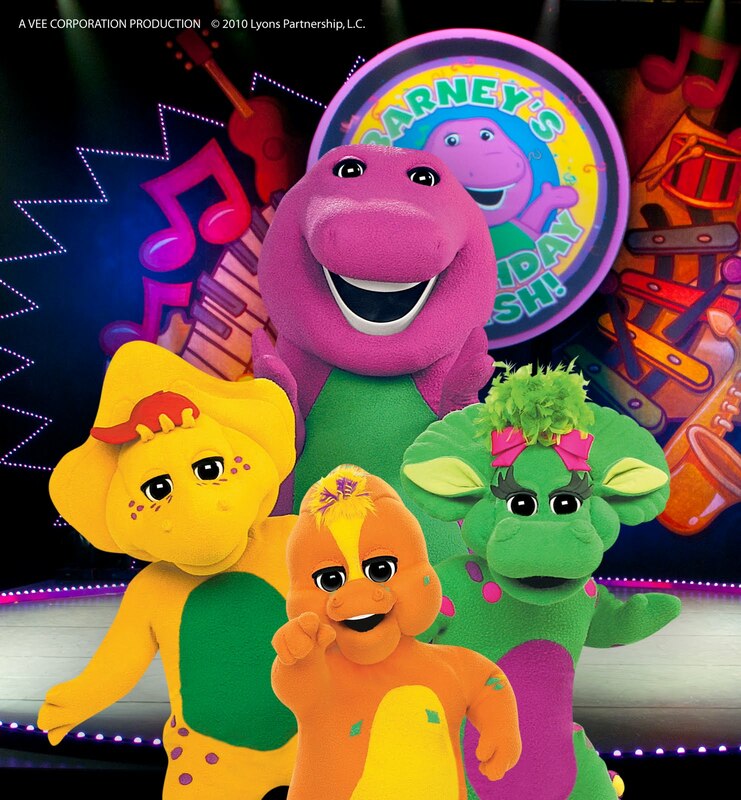 Celebrate with Barney on his birthday at this BRAND NEW, interactive, live stage concert, featuring more than 25 fun and upbeat sing-along tunes including your children’s favorites, such as "Mr. Knickerbocker", "Dino Dance", "Baby Bop Hop" and "Rock ‘n Roll Star". 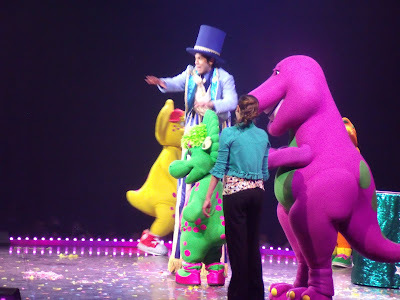 You’ll be singing and dancing in the aisles with your favorite purple dinosaur and his friends Baby Bop, BJ and Riff. It’s a fun-filled show all about sharing, caring and friendship -- brought to you by the power of your imagination! Barney is a beloved friend in our household. 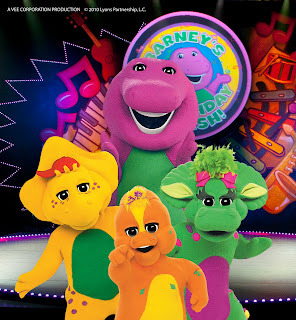 Our children have watched Barney faithfully for the past couple of years, soaking in every lesson that this lovable character has offered up on his adorable children's series. Though song and dance, he teaches valuable educational lessons as well as lessons in manner's and friendship through upbeat songs and dance. 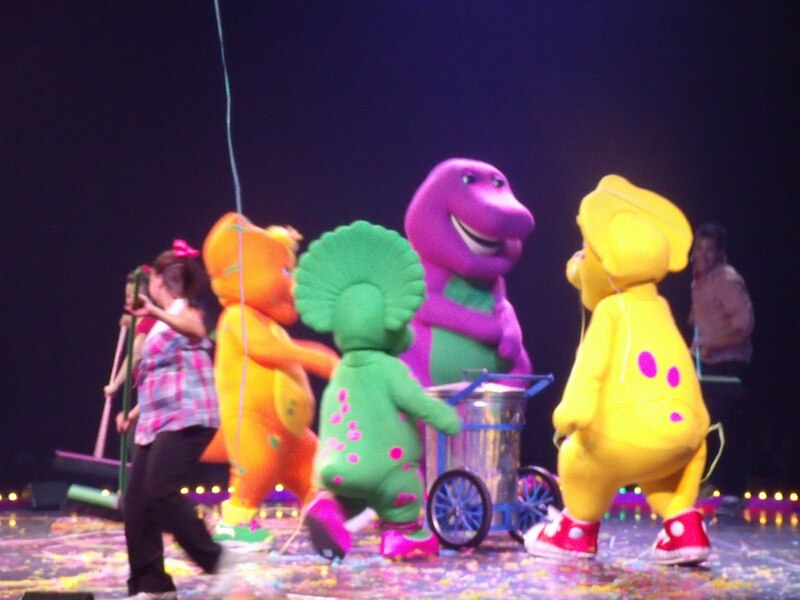 Being the big fans that we are, we were absolutely thrilled to attend Barney Live In Concert : Barney's Birthday Bash, last night!. Serenaded with several of our favorite Barney songs, and a few that were brand new to us, the kids showed their delight as they got up to sing and dance along in the aisle (as did many little ones!). 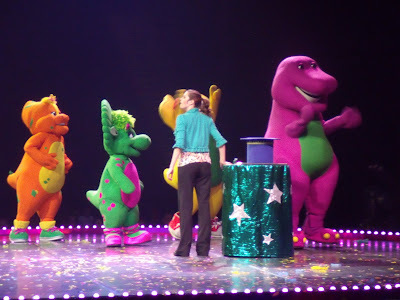 The cast of the show frequently exited the stage to interact with the audience and dance along with their young fans (excited little one's scurried to get a high five or hand shake from their favorite characters!). The show was lively and continuously captivated the kids attention with little surprises throughout the performance; such as large bursts of confetti and a visit from Mr. Knickerbocker himself (pictured above)! The entire evening was packed with fun, and concluded as Barney was presented birthday gifts, and was serenaded with Happy Birthday by a very enthusiastic audience! Fantastic night out with the family!